Wherever you go, you are confronted with rules and regulations. Whether you’re at school, at work, or even just going on a hike, there are bound to be some guidelines that you have to follow. It starts from a young age, when your parents or guardians tell you what you can and can’t do. When you’re a kid, you look forward to growing up, thinking that you won’t have to follow so many rules when you’re an adult. Unfortunately, however, that is far from the truth. Adults have just as many rules to follow, and the punishments for breaking them can be even harsher than they are for children. In fact, it can start to feel a bit restrictive after a while. Perhaps that’s why some people get so much satisfaction out of breaking the rules. They don’t have to be big rules. Often, small, inconsequential rules are the best rules to ignore. It’s a form of miniature rebellion, and it can be as hilarious as it is refreshing. Here are some people who did just that. 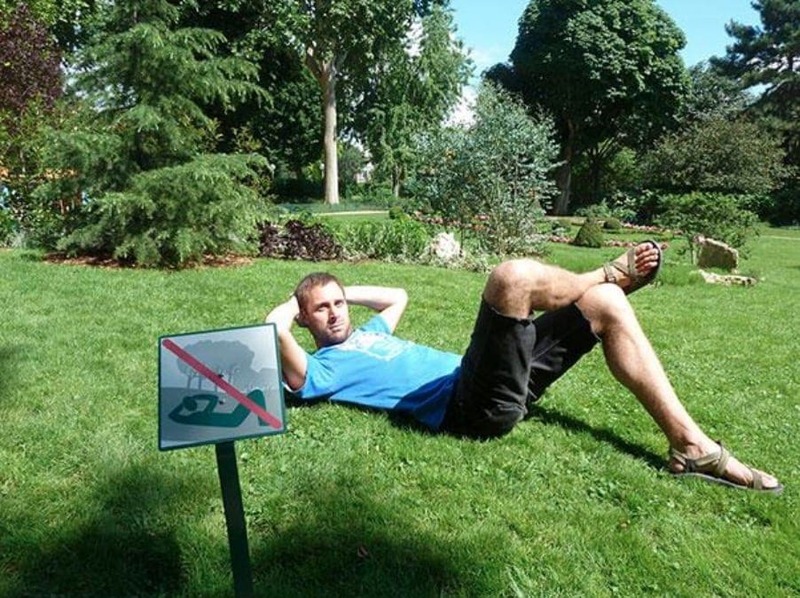 They blatantly ignored signs telling them what to do – with hilarious results. 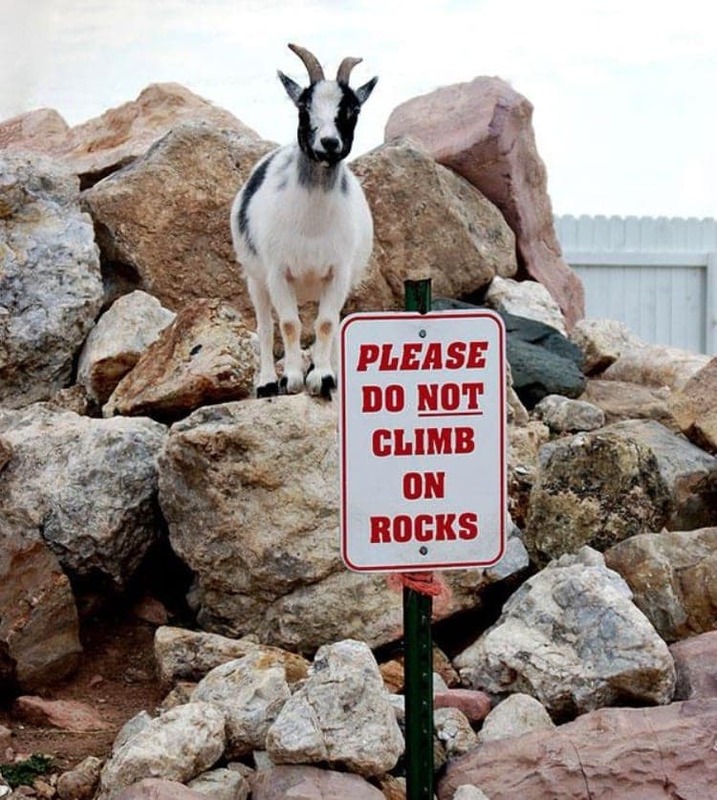 We can’t actually blame this goat for breaking the rules, since she most likely can’t read the sign telling her not to climb on the rocks. She’s probably just following her natural instinct to get to a higher vantage point. This goat clearly has no idea that she’s doing anything wrong, as she stares quizzically at the person taking her photograph. We are fairly certain that this is not the kind of diving that the sign is talking about. Usually, such “no diving” signs are most often placed as a safety precaution near swimming pools and other bodies of water that are too shallow to dive into. That’s because if you dive headfirst into a shallow pool, you’re likely to hit your head on the bottom and wind up seriously injured. Anyway, who would suspect that someone would decide to enter this very tiny pool in full scuba diving gear? 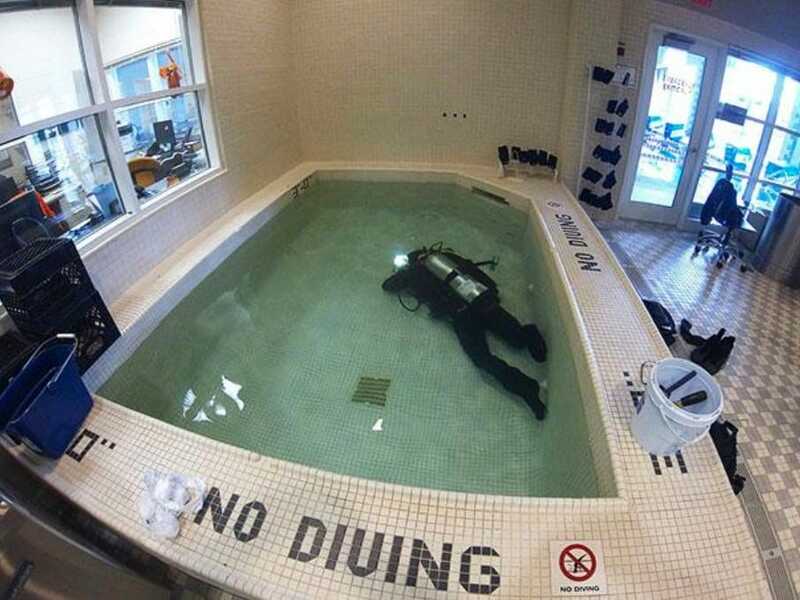 Nevertheless, the sign does clearly say “no diving,” and doesn’t specify any particular type, so the diver is definitely still breaking the rules. This is what you get for saying “thank you” too soon! 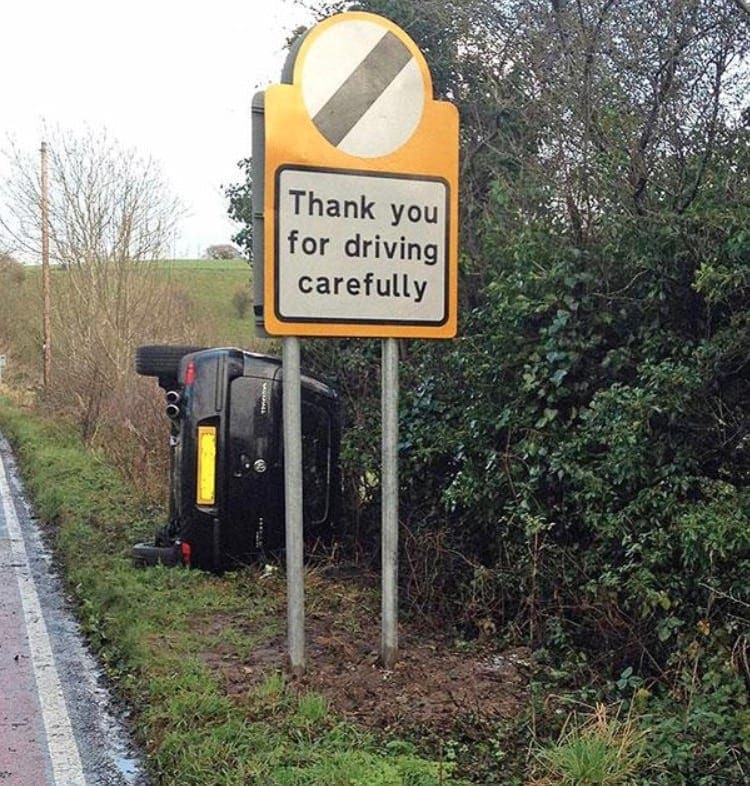 Someone clearly didn’t get the message about driving safely, and the makers of this sign have nothing to thank them for. In fact, this looks very much like the opposite of driving safely. While car accidents aren’t funny, it is funny to see a car on its side right next to a sign that requests that people drive safely. It does look like an accident, so the driver of the car probably didn’t break the rules on purpose, but it’s still a case of someone blatantly disobeying a very clearly worded sign. We do hope the people inside the car were okay, though! Usually when a sign says to “keep off,” you assume that they’re talking about the grass or ground where the sign stands. 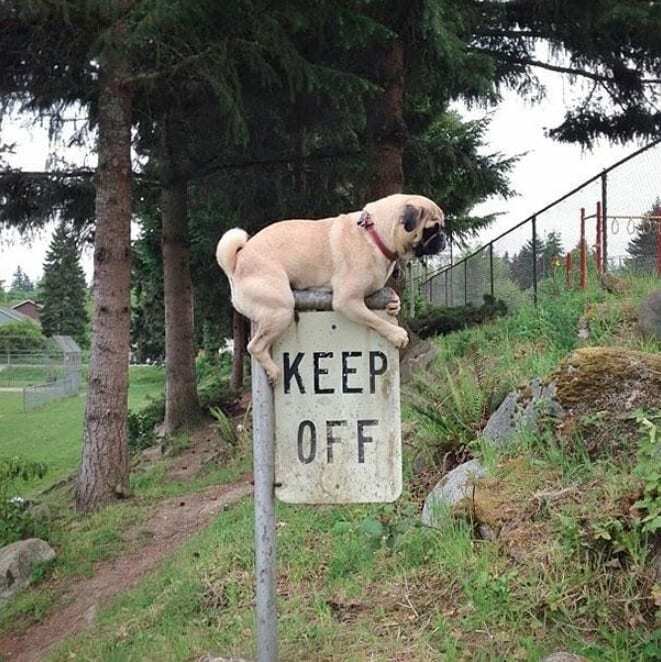 This adorable pug, however, is brazenly defying the sign in the most literal way possible. He is perched precariously right on top of the sign, and seems like he is holding on for dear life. We know that there is very little chance that the dog climbed up on the sign on its own, so it’s more likely that its owner saw an opportunity for a funny photo and went for it. 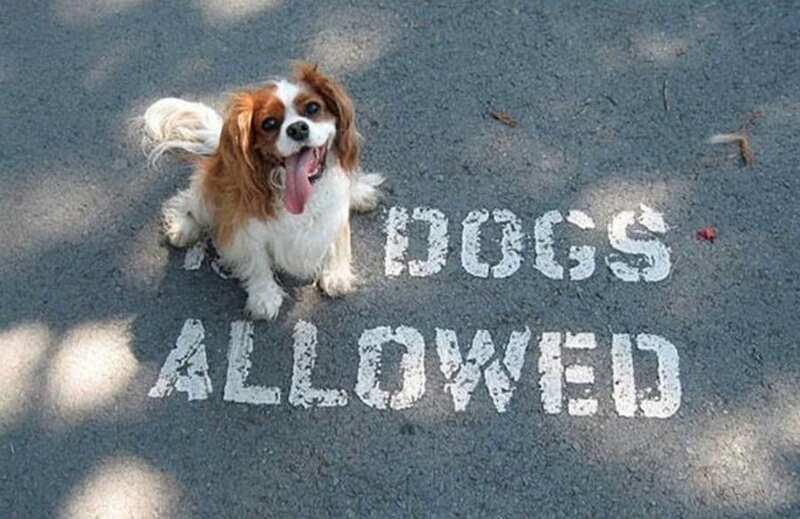 In that case, it’s really the owner who deserves the blame for breaking the rules, not the dog. This is an extreme case of someone going out of their way to intentionally break the rules. It wasn’t just an inconvenient rule or a sign telling you not to do something like walk on the grass or open a door. 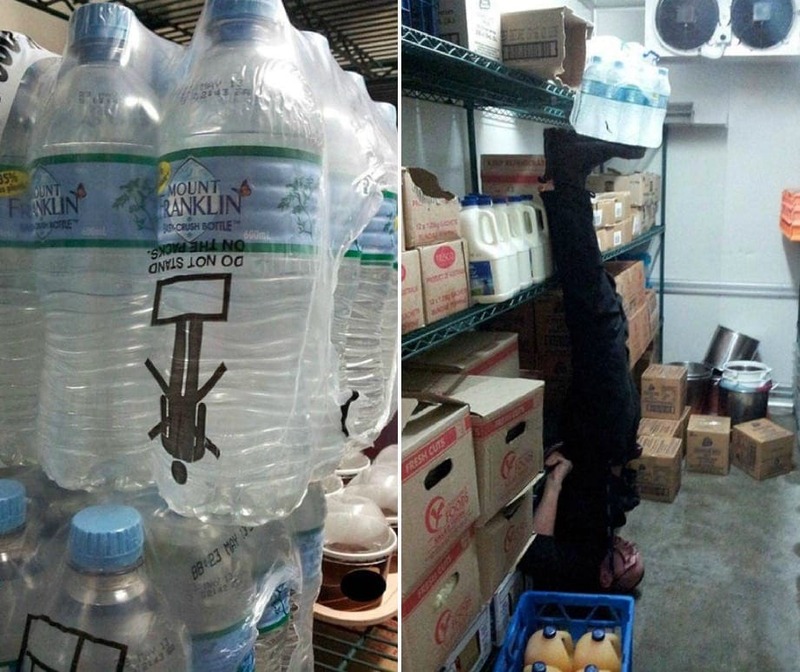 This is a guy who saw a warning on a package of water bottles telling him not to stand on the package, and decided to do the opposite. However, unfortunately for him (and fortunately for us) the warning was printed upside down on the plastic packaging. So, in order to really do exactly the thing in the picture, he had to stand on his head with the water on his feet. It’s actually quite an impressive pose. 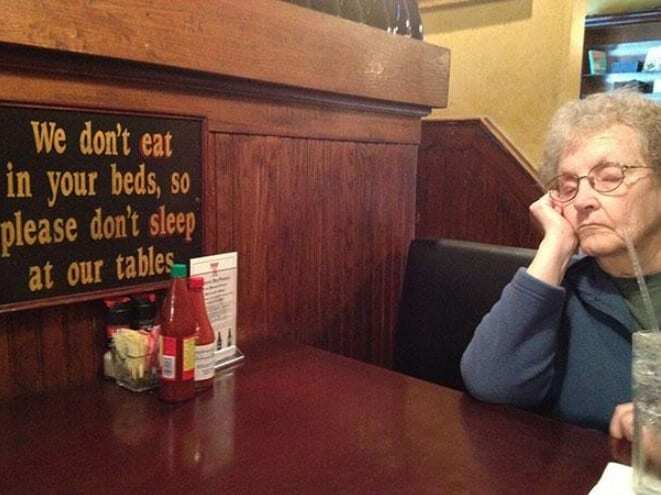 The fact that there is a sign at this restaurant that tells people not to sleep at the tables seems to indicate that it’s a regular occurrence. However, despite the sign and her best efforts not to nod off, this woman simply couldn’t keep her eyes open. She has officially fallen asleep with her head resting in her hand and her elbow on the table. We have seen some people fall asleep in some pretty odd places, but a restaurant is definitely not the locale for a nap. Here is a guy who is doing the exact opposite of what the sign says. 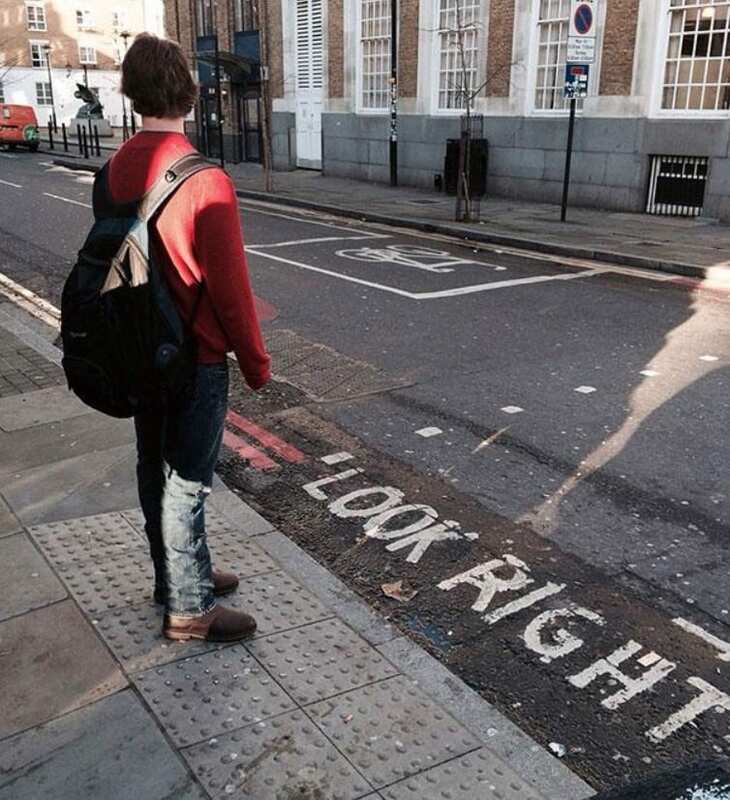 It’s telling him to look right and he, without shame or hesitation, is looking left. There’s a reason for this rule – the cars on this one-way road come from the right, so you need to look right before you cross for safety. 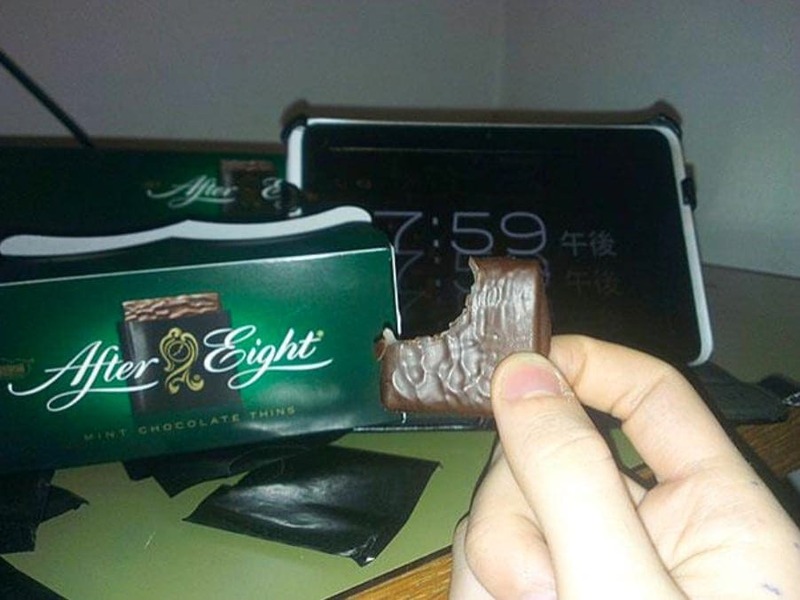 Of course, he may have looked right as well before the picture was taken, but that doesn’t negate the fact that he’s been caught obviously breaking the rules, purely out of spite. 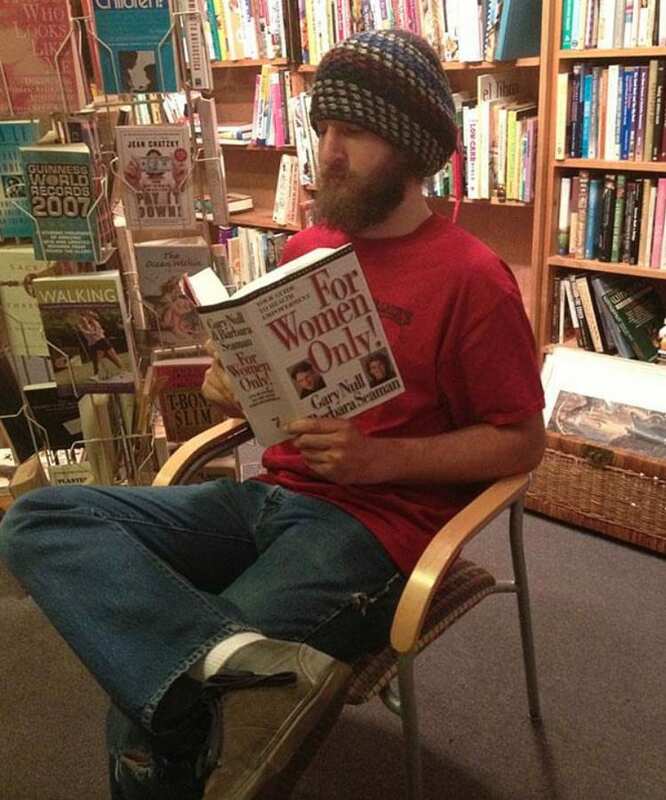 It is pretty funny to see a guy sitting in the library reading a book that’s called For Women Only, but he might be getting some valuable knowledge out of it. 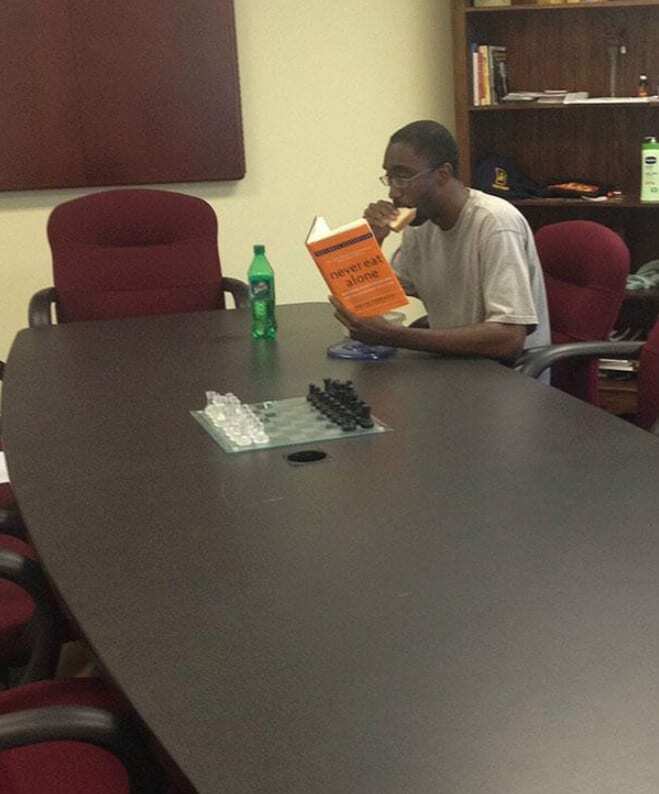 Anyway, as far as we’re concerned, it’s not right to tell people what they can and can’t read, so even though this guy is clearly disregarding the title of the book, we think it’s great that he decided to read it. Now we just have to find a woman reading a book for men. When you’re in a bad mood, there’s simply nothing worse than someone telling you to smile, or turn your mood around. 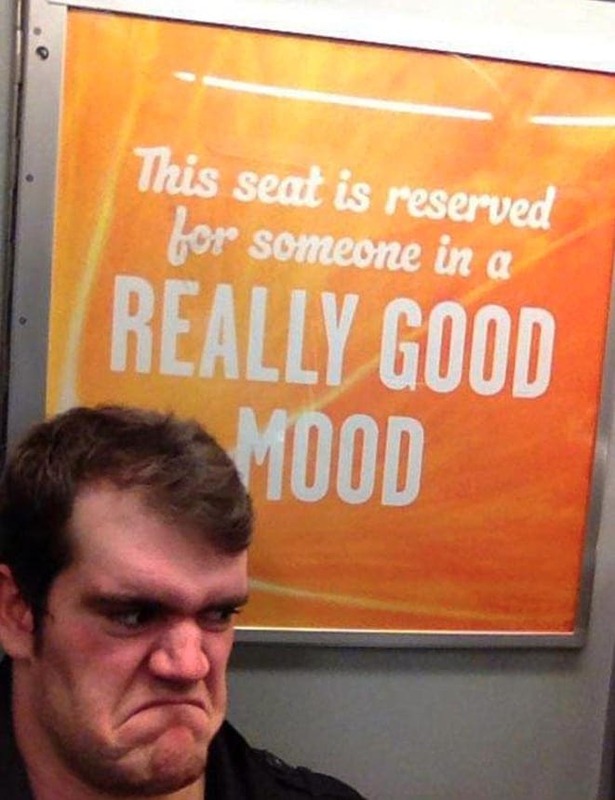 So when this guy got on the train and saw that there was a sign reserving a seat for someone in a “really good mood,” he was having none of it. He went right ahead and sat down in that seat anyway, putting on his angriest scowl and rejecting the rule completely. We doubt this is a regulation that will be enforced, anyway. If you were not from this planet and suddenly landed on Earth and took a look at the street signs, you probably wouldn’t understand them very well. In that case, you would probably look at this particular sign and think that it was saying no men walking hand-in-hand with their sons allowed. 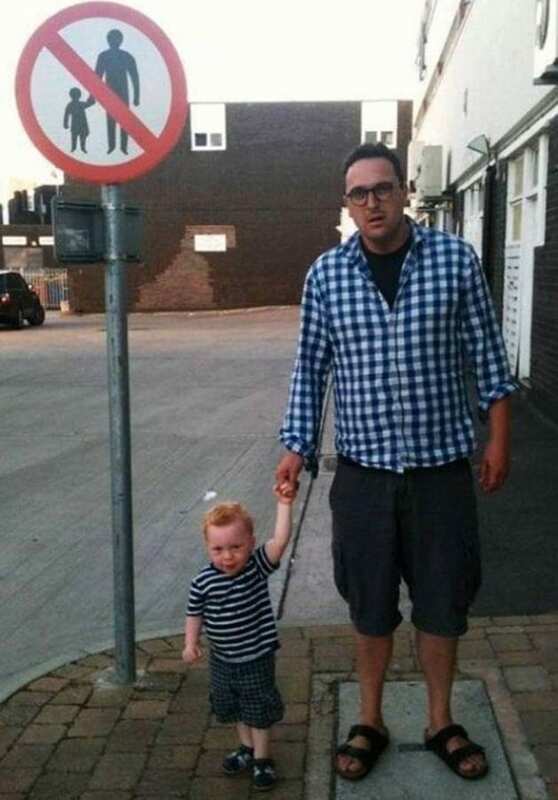 This father and son pair perfectly imitated the pose in the picture on the sign, and stood right next to it. 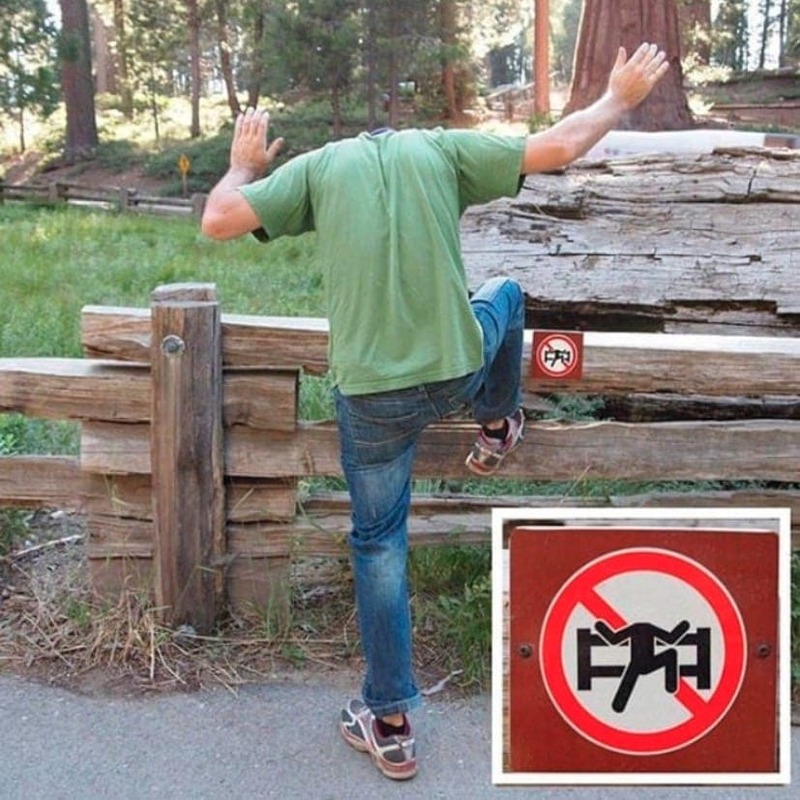 We know that this isn’t exactly what the sign means, but it sure is funny. This is another sign that prematurely thanks people for following a rule. To this young man, it’s probably almost an invitation to ignore it. 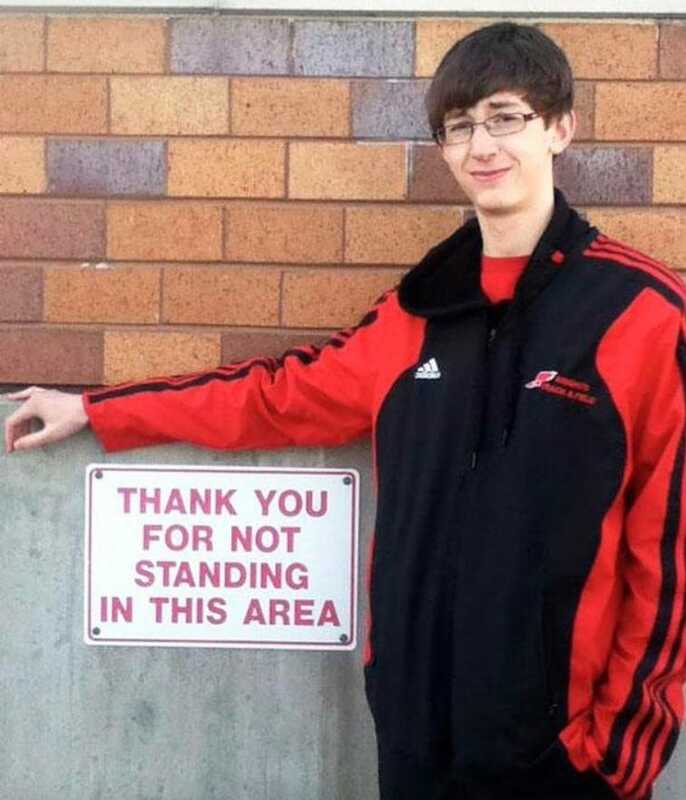 He decided to have a photograph taken of himself standing right next to the sign that thanks him for not standing in that area. He even has a smug smile on his face. We don’t blame him – after a long day listening to instructions and following rules at school, it probably feels good to disobey something. Why not cut an onion with this knife? 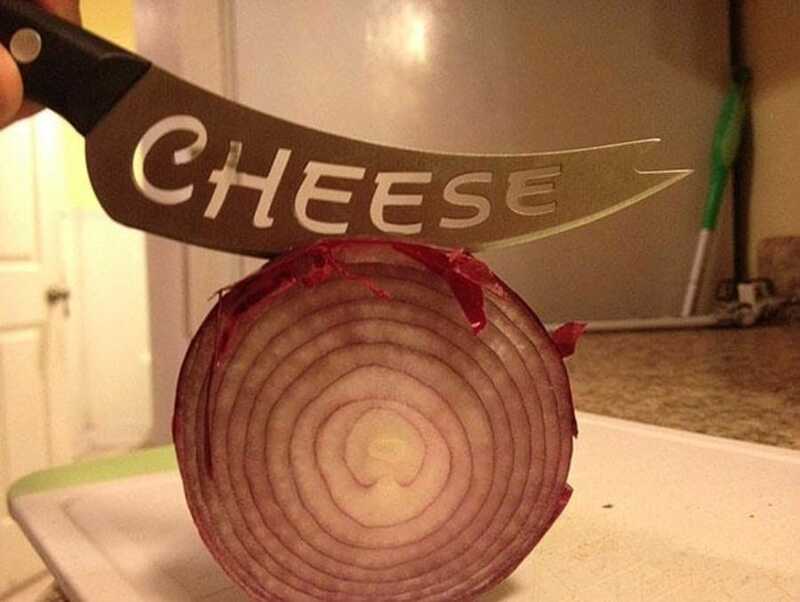 It looks plenty sharp, even if it is clearly labeled “cheese.” The person cutting this onion is definitely disregarding the directive on the knife, but nobody is there to enforce it. Their eyes are probably blurred by tears, anyway. There is not a particularly good reason why you would have to designate a knife to cut only a certain food, but maybe it’s a marketing ploy to make people buy more knives. Not only is this dog sitting in an area that is designated as “no dogs allowed,” it’s sitting right on the word “no,” changing the rule to mean the opposite of what it’s intended to mean. This begs the question – is it still disregarding the rule if a word is covered and you can’t read it? No matter what, this dog is certainly adorable, and we can’t blame it for sitting where it is. After all, it can’t read the sign anyway. It’s pretty funny to see a guy reading a book telling him not to do exactly the thing that he is doing while he reads it. The title of this book is Never Eat Alone, and that is precisely what he is doing. We can’t tell if he is disregarding the instructions on purpose, or if someone just stumbled across this scene and thought it warranted a photograph. In fact, this is the only person pictured in this list that might actually be breaking the rules unintentionally. These delicious treats are called “After Eights” because they were originally intended to be used as a sort of after-dinner mint. That being said, very few people actually follow that rule, and you can find people eating these chocolates during the day pretty much anywhere that they are sold. However, when this guy decided to take a picture of himself eating one at exactly 7:59, documenting himself ignoring the direction in the name, he was really living on the edge. This sign is so very specific that it makes disobeying it that much funnier. It doesn’t indicate that people should keep off the grass, or refrain from walking or sitting on it. No, it only seems to say that you are prohibited from lying on your back on the grass with your knees up and your hands behind your head. So of course, this guy went ahead and did exactly that. He looks very satisfied with himself, too. This is another funny looking sign that really wouldn’t make very much sense if you weren’t already familiar with the concept behind it. 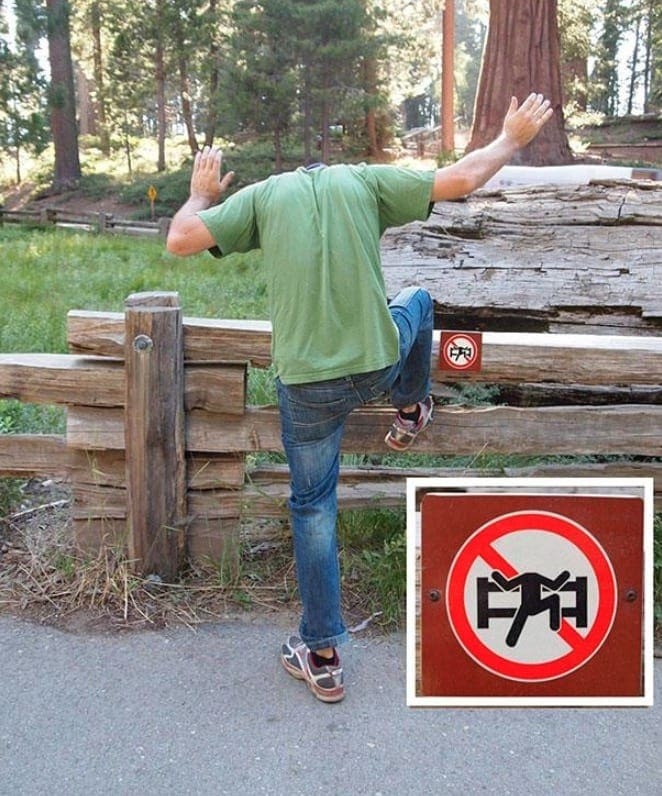 It truly looks like it’s saying that it’s forbidden for people with no head to pose in that specific position next to the fence. We know that it’s really telling people not to climb on the fence, but this person decided to take it literally. He posed in a very good imitation of the picture, making a very funny photo.